Ex-City manager Paul Lambert made his first return to Carrow Road on Tuesday night as his new club Aston Villa took on Norwich in the Capital One Cup quarter-finals. City have been on an unbeaten run of 10 games in all competitions, whilst Villa have won one in their last 16 away games. To top the occasion, City boss Chris Hughton was celebrating his birthday and hoped he would get his birthday wish of being in the semi-finals of the cup. 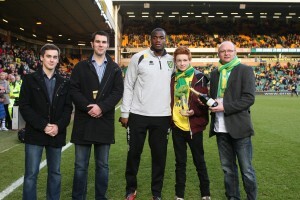 That wasn’t to be though as Norwich crashed out suffering a 4-1 defeat. Steve Morison put the Canaries ahead, but Holman responded immediately with a super strike. Half-time came around and Villa were forced to sub England striker Darren Bent due to injury. Morison and Beneteke were disappointed to have their goals at the start of the second half ruled out for offside, but it was Villa who took the lead and built their performance from there. Substitute Weimann got on the end of a cross, before repeating his attacking prowess to grab Villa’s third goal. The game was put to bed in the 90th minute when Beneteke got his goal, striking well from the edge of the penalty area. 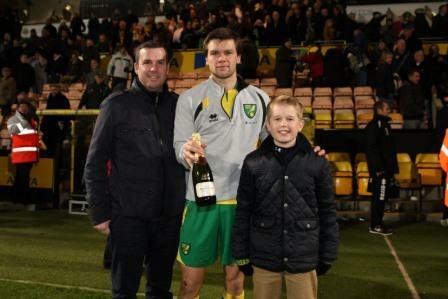 Jonny Howson was awarded the Anglian Home Improvements Man of the Match award. 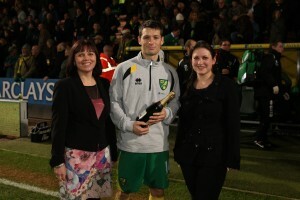 On Saturday, Norwich played Wigan at Carrow Road and we are pleased to confirm that the final score was Norwich 2 – Wigan 1. Wes Hoolahan, Irish international headed in the winner against Wigan and helped put City at seventh place in the Barclays Premier League following the signing of his new contract with the club. It was obvious that the team was disappointed following their lose against Aston Villa, but they came back with a win in this game. With another exciting game consigned to the archives of history, one other event that will be added to this impressive list will be Grant Holt’s 150th appearance for the club.